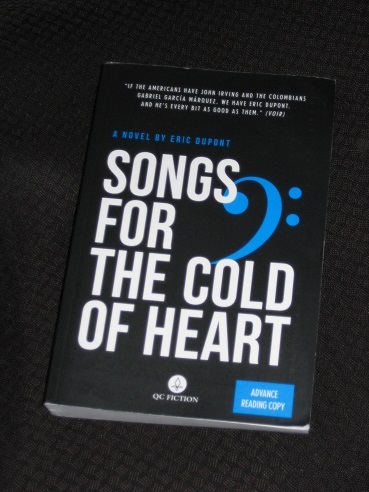 Songs for the Cold of Heart (translated by Peter McCambridge, review copy courtesy of the publisher) is an epic tale centred on the Lamontagne family, French-Canadians with a touch of German blood in their veins. We begin in 1958, in the town of Rivière-du-Loup, where Louis Lamontagne is home with his three children, knocking back gin as he starts another tall tale from his eventful past. This is the reader’s cue to get comfortable and settle down for a long ride; we’re six-hundred pages from our eventual destination, and there’ll be a whole lot of stories before we get there. The emcee stepped back to reveal the beast. Louis Lamontagne must have been over six foot six. His hair dark and wavy, the hair of the Roman emperors in American black and white movies. Unlike his rivals, all of whom seemed to have been moulded from a barrel, Louis Lamontagne was nothing but muscle and bone. But what bone! When he flexed his right arm, a bicep as big as a cantaloupe sprung up, and an appreciative murmur rippled through the tent. Clad in a skin-tight navy blue leotard, Louis Lamontagne did not appear to believe in the virtues of humility and prudishness cherished by a certain segment of society. But no one in the audience seemed the least concerned about that. Floria is far from the first (or last) woman to be dazzled by the young colossus, and even US army drafters fall over themselves to get close to him, leading to a stint for Lamontagne in the army during World War Two. In truth, though, Louis is merely the supporting act, with the following generations carrying the bulk of the story. Young Madeleine, the eight-year-old daughter mixing the drinks back in 1958, grows up to become a succesful businesswoman, and her two sons, Gabriel and Michel, gradually move into the lead roles. As the stage expands, taking in New York, Berlin and Rome, you could be forgiven for imagining that the past is forgotten. However, the novel is actually working its way around to revisiting some of the actions of the past, and by the end of the book, the family will discover certain secrets that have been hidden for most of the century. Songs for the Cold of Heart is an ambitious, expansive story, a multi-generational family tale with a fair dose of magical realism (including a matriarch who dies but stays upright and arrows flying up into the sky, only to land elsewhere decades later). If you’re looking for reference points, then works such as Midnight’s Children, One Hundred Years of Solitude or Beauty is a Wound will probably give you a fair idea of the nature of Dupont’s book. The novel is divided into sections told by different characters (and in differing formats), with the action jumping around, rarely settling in one place for too long, and in terms of the content there are several similarities with his earlier work in the way he handles serious issues with a light, humorous touch. Irene and the children ventured into the living room one by one. Louis was standing in front of a wooden dresser with a screen in the middle of it. A man was reading a news bulletin. In the blue light, the Lamontagne family and Solange Bérubé watched the first pictures of the victorious presidential couple. The crowd was ecstatic, people were shouting in English. A cold wind blew through the house. Later, as Madeleine becomes (very) successful, another aspect to this strand is developed. Are these humble origins something to be proud of or a stain to hide at all costs? As it turns out, not all the characters have the same opinion when it comes to dealing with their roots. However, Songs for the Cold of Heart eventually outgrows its provincial beginnings and develops into a novel spanning the globe. The story is intricately plotted, with every little detail there for a reason, including countless parallels and connections for the reader to spot. In addition to a bass clef birthmark and the unusual teal-coloured eyes several characters inherit, we puzzle over the relevance of gold chains with initials and the parallels between characters (such as relationships developing over singing lessons, decades and continents apart). Dupont delights in planting clues and red herrings in equal proportions, and while we may think we know where it’s all going, at the end he pulls the rug from under our feet, causing us to rethink what we thought we knew. For anyone looking for a guide through the novel, the writer provides one in his riffs on the opera Tosca, a recurring motif, not only in the several visits to the opera (and Michel’s singing career). Teasing us, Dupont and his characters constantly return to the story, with sly hints at parallels between the novel and the opera (such as Solange’s nickname, Suzuki, given less for a Japanese connection than her love of motorbikes…). The final scenes include a rather daring adaptation, tying the opera to the second-world-war stories that take up so much of the second half of the book. It’s a shame, then, that I know nothing at all about it – I suspect there’s a lot here that went whizzing over my head. ‘A good old-fashioned epic yarn’ is about right, Tony. I thought much the same about this hugely entertaining, highly original saga. Just started this, as it’s on the Giller longlist- and I’m seeing the Irving and Marquez influences hinted at in the blurbs. This is gonna be good. This got shortlisted for the Giller! And just my luck it’s not available in UK and I’ll have to order it on import, which will cut down the time I have available to read the 600+ pages of it! That’s a pain – no digital version available? Perhaps you might be able to get the publisher to send you a copy? Nope; no digital version. Is it published in Australia?